Recorded as Hopkin, Hopkins, Hopkinson, and since the 17th century much associated with Wales, this is an English patronymic derivative of the original pre 5th century Germanic warrior name Hrod-berht, translating as ‘renowned-fame’. ‘Borrowed’ by the French around the time of the Emperor Charlemagne in the 8th century, its spelling was slightly changed to Robert and became equally popular. In that spelling that it was introduced into England, Scotland and ultimately Wales, after the famous Norman Conquest of 1066. Over the next four hundred years Robert, perhaps as a result of its interesting meaning was so popular that it developed a wide range of surname variations, many not obviously connected with Robert - including this one. These variants now recorded as surnames in the own right include such short forms as Dob(b), Hob(b), Hop, Nob(b) and the most direct Rob, Robb, Robin, Robbins, and Robinson. 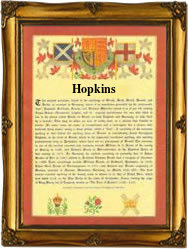 Not surprisingly with such a pedigree, Hopkins is one of the earliest recorded surnames with examples in English records such as Nicholas Hobekyn of the county of Cambridge in the Hundred Rolls of England in 1273, Rychard Hobbekynessone in the Putname rolls of Cheshire in 1354, and Walter Hopkin of Warton, in the wills record of Lancaster in 1563. Surnames were much later in Wales than the rest of the British Isles, and when first recorded and given due allowance for both a change of language as well as dialect and (indifferent) spelling, it was as ab Popkyn, or the son of Hopkin. An early Welsh example was Johannis ab Popkyn in the rolls of the county of Monmouth in 1610. Over the centuries there were several coats of arms granted to name holders. The first was probably Hopkinson of Alford, Lincolnshire, in the time of Queen Elizabeth 1st (1558 – 1603) although the most unusual - is to Hopkins of Maryland, in the American colony of that name, in the year 1764. This was about ten years before official US independence. The basic blazon has a black shield, a gold chevron in chief between two pistols, and a silver medal inscribed with the head of Louis XV, the king of France. This suggests the family were much involved in the defeat of the French during the Seven Year Wars of around that time.